(Postal Stationery) 1857/59 8d. dark brown envelope with type I of colourless embossing on backflap; good unused. (South) 1890s OHMS formula registration envelope from Education Department additionally franked pair O.S. overprinted 2�d. cancelled by single unclear square circle; vertical filing crease at left. (Postal Stationery) 1857-59 8d. dark brown envelope with type II of colourless embossing on backflap; good unused. (Postal Stationery) 1857-59 9d. violet brown envelope with type I of colourless embossing on backflap; good unused. (Postal Stationery) 1857-59 9d. violet brown envelope with type II of colourless embossing on backflap; good unused. (Postal Stationery) 1857-59 One Shilling yellow envelope with type I of colourless embossing on backflap; good unused. (Postal Stationery) 1857-59 Two Shillings dark blue envelope with type II of colourless embossing on backflap that is slightly stuck down; good unused. (Postal Stationery) 1857/59 1d. pale blue envelopes with both types of colourless embossing on backflap; good unused. (Postal Stationery) 1857/59 1s. yellow envelope with type II of colourless embossing on backflap; good unused. (Postal Stationery) 1857/59 2d. green envelope with type II of colourless embossing on backflap; good unused. (Postal Stationery) 1857/59 4d. dull pink envelope with type II of colourless embossing on backflap; good unused. (Postal Stationery) 1857/59 4d. pink envelope with type I of colourless embossing on backflap; good unused. (Postal Stationery) 1857/59 6d. violet brown envelope with type I of colourless embossing on backflap; good unused. 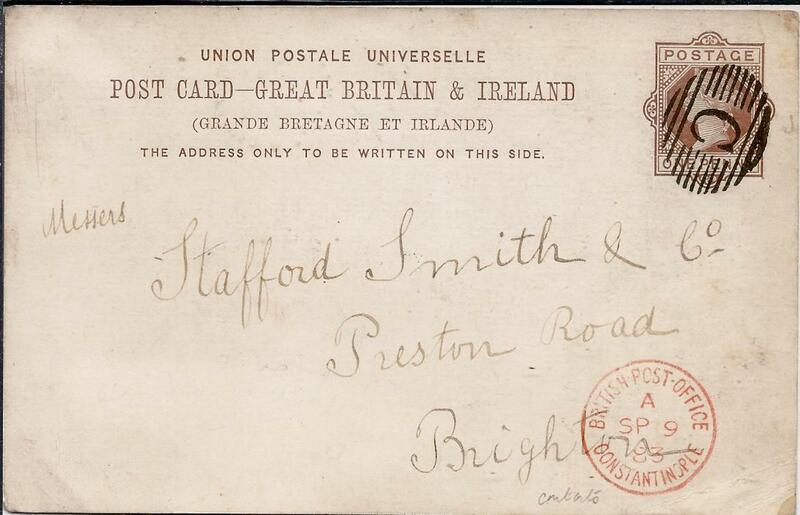 (Postal Stationery) 1868 new size 10d. brown orange envelope, part De La Rue & Co. watermark with type V of colourless embossing on backflap; small creasing to embossing on flap, good unused. 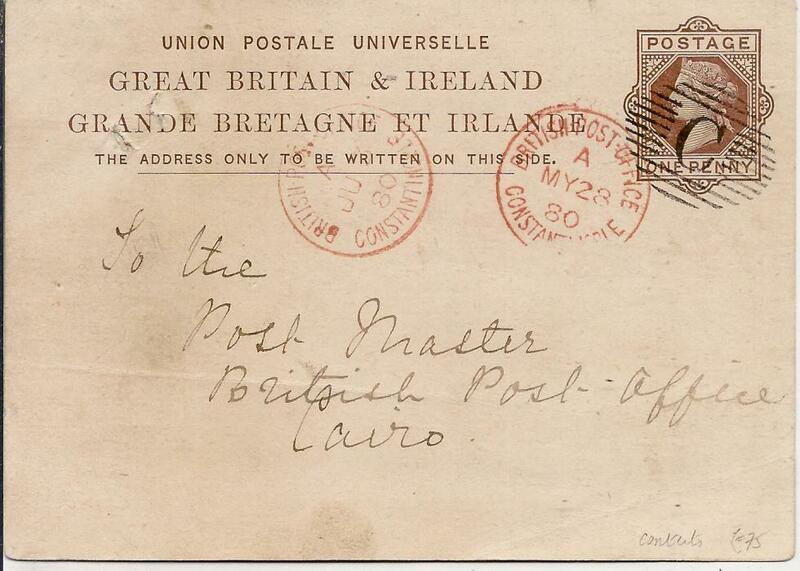 (Postal Stationery) 1868 new size 6d. violet brown envelope on thin white wove paper, without watermark, with type IV of colourless embossing on backflap; good unused. 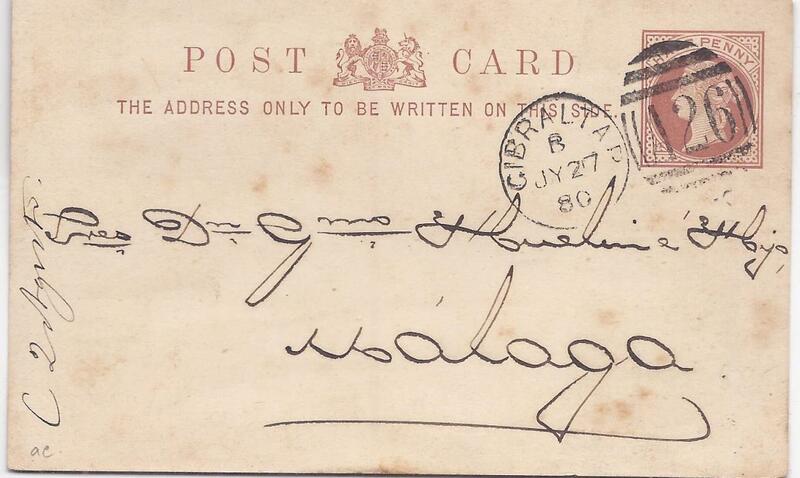 (Postal Stationery) 1880 Great Britain 'Half Penny' stationery card to Malaga cancelled by A26 duplex; some slight tone spotting.